The Lockheed Martin P-175 Polecat was a worthy successor to the reconnaissance aircraft projects that had come to Groom Lake from the Skunk Works through the decades. The first X-45A, with its weapons bay door open, dropped its first bomb in March 2004. The Phantom Ray, the successor to the X-45C J-UCAS, made its first flight in 2011. In the world of popular interest in aviation, the first decade of the twenty-first century could be called the Decade of the Drone. Certainly the drone has become synonymous with clandestine military operations in places such as Afghanistan and Pakistan. These aircraft, called RPVs in the third quarter of the last century and unmanned aerial vehicles (UAV) more recently, were first widely used for aerial reconnaissance missions during the war in Southeast Asia and for combat operations since the turn of the century. However, drones have been around for almost a century. The first military drone designed for combat, the Kettering Bug, was being tested in 1918 and might have played a role in World War I had that conflict not ended when it did. By midcentury, the hobby of flying remotely controlled airplanes was widespread. During World War II, an enterprising Californian named Reginald Denny started a company called Radioplane, which sold thousands of scaled-up radio-controlled models to the US Army and US Navy as target drones. Northrop later bought Radioplane and continued building both piston-engine and jet target drones. After World War II, as discussed in chapter 12, Ryan Aeronautical (later Teledyne Ryan) developed a line of jet-propelled target drones that were called Firebees. In turn, these were adapted for reconnaissance missions over North Vietnam, Laos, and elsewhere during the 1960s, propelling the company down a path toward more sophisticated RPV reconnaissance aircraft such as Compass, Compass Cope, and Patent Number 4019699. By the 1990s, as RPVs were now being called UAVs, they were growing in sophistication. Many surveillance drones in service then, as now, such as the RQ-2 Pioneer, RQ-5 Hunter, or Boeing Insitu ScanEagle, were small, slow, piston-engine aircraft. Others are larger and much more sophisticated. Teledyne Ryan’s experience with the Compass Cope, for example, led to the RQ-4 Global Hawk, a large jet aircraft that can operate at 60,000 feet and stay aloft for more than 24 hours. Drones captured the headlines after 2001, not only for their reconnaissance capability, but also for their offensive capabilities. Arming the General Atomics RQ-1 Predator with Hellfire missiles to take out terrorists and insurgents came as an afterthought to its original concept. However, when operations were watching the enemy in real-time video feeds, there was a natural inclination to attack the enemy that could be seen. The reconnaissance RQ-1 became the armed, multimission MQ-1, and General Atomics developed the much larger and more capable MQ-9 Reaper, which was capable of carrying more and varied offensive ordnance. 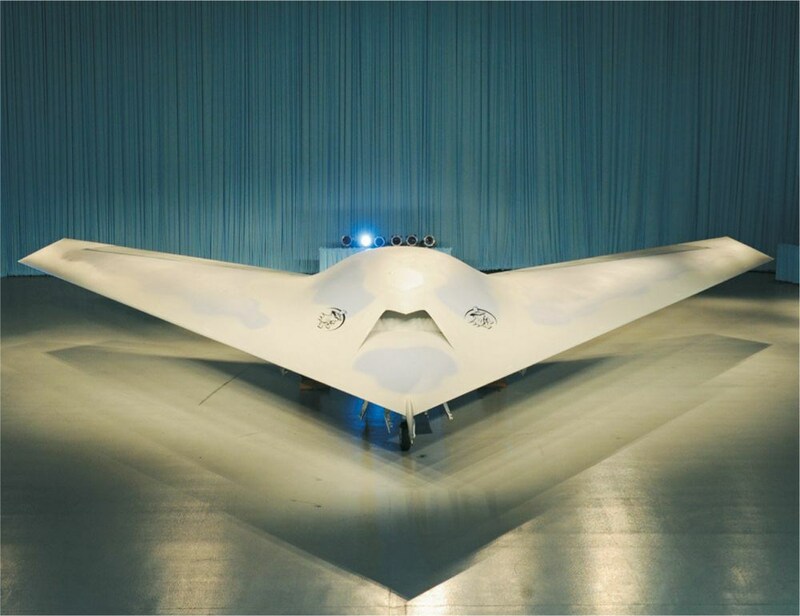 In the meantime, in 1998, DARPA and the US Air Force had initiated the Unmanned Combat Air Vehicle (UCAV) program, aimed at demonstrating unmanned stealth aircraft that could be flown on deep penetration missions, such as suppression of enemy air defenses, into heavily defended air space. This led to the Boeing Phantom Works X-45A, first flown in 2002, and the Northrop Grumman X-47A Pegasus, which made its debut in 2003. 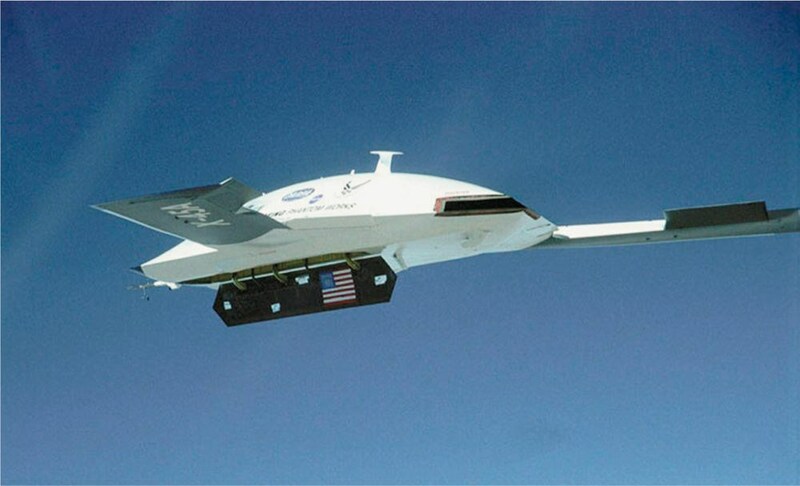 Under the program, the Phantom Works project utilized technology from the Bird of Prey, while the X-47A would have benefited from the obscure Teledyne Ryan 4019699 research. The UCAV program later became the Joint Unmanned Combat Air System (J-UCAS). The “J” was inserted when the US Navy expressed keen interest in the previously US Air Force program, specifically in the X-47A. Meanwhile, UCAV became UCAS when the DOD decided to consider the overall system developed within a program, not just the vehicle. Meanwhile the term UAS was introduced to supersede UAV, although in practice the UAV acronym continued to prevail. The “white world” X-45A and X-47A never inhabited that arcane world where their existence was denied and are not known to have been tested in the skies over Area 51. However both projects involved technology that suggests that they may have “black world” cousins whose existence may not be disclosed for decades. One unmanned aircraft definitely straddles that line in the Lockheed Martin RQ-3 DarkStar, which brings the narrative full circle and back to the Skunk Works. Indeed, the DarkStar has evolved into programs that are known to have been seen over Area 51 and to others that simply remain unknown. 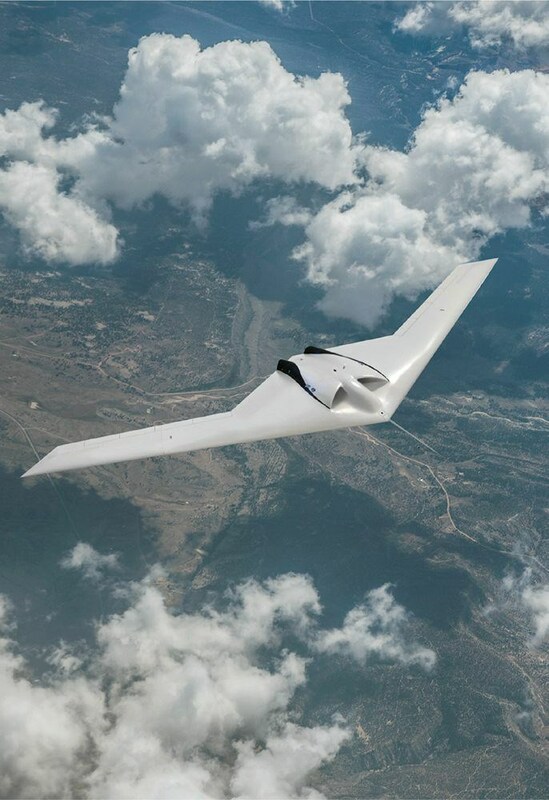 The DarkStar originated as Lockheed’s entry in DARPA’s High Altitude Endurance (HAE) UAV advanced airborne reconnaissance program, which was initiated in 1993 and which DARPA managed on behalf of the Defense Airborne Reconnaissance Office (DARO). HAE had evolved out of DARPA’s High-Altitude, Long-Endurance (HALE) program of the 1980s that led to the development of the Boeing Condor, a huge UAV with a service ceiling of 67,000 feet. During the 1990s, each of the armed services developed a complicated and confusing taxonomy of “tiers” to define its UAV program, but this practice fell out of use in later years, probably because the respective nomenclature of the services did not align, and within the services, the drones themselves did not conform precisely to the tiers. The two complementary US Air Force aircraft developed under HAE were described not as Tier II and Tier III, but as Tier II Plus and Tier III Minus. Tier II Plus identified a strategic UAV operating up to 65,000 feet with a range of 3,000 miles, slightly beyond the performance envelope of Tier II. Tier III Minus UAVs were strategic HAE vehicles embodying LO characteristics, but they had a shorter endurance than Tier II Plus or Tier III aircraft. Under HAE, the Tier II Plus aircraft was the RQ-4 Global Hawk, while the Tier III Minus was the RQ-3 DarkStar. Both were intended to be reconnaissance aircraft, not UCAVs. The DarkStar first flew in 1996, while the RQ-4 Global Hawk first flew in 1998. The Global Hawk was a longer endurance, higher flying aircraft, while the DarkStar was designed as a stealth aircraft capable of operating in hostile environments. While elements of the Global Hawk’s ongoing twenty-first century operational career remain classified, it has been widely photographed and was never a black program. The DarkStar, meanwhile, came and went quickly, leaving much speculation about follow-on aircraft. Resembling a “flying saucer” from the front, the DarkStar airframe was composed primarily of nonmetal composites, and it had no vertical tail surfaces. It was only 15 feet from front to back, but its wing spanned 69 feet. The DarkStar had a gross weight of 8,600 pounds and was powered by a single Williams FJ-44-1 turbofan engine. It had an endurance of 12.7 hours, or eight hours above 45,000 feet. The first DarkStar prototype made a successful debut flight in March 1996 at Edwards AFB but crashed on its second flight a month later. After twenty-six months of reworking, the second DarkStar made a forty-four-minute fully autonomous first flight in June 1998, but the Defense Department officially terminated the Tier III Minus program in January 1999. By this time, it seemed that there was more interest in the potential usefulness of a long range Global Hawk than a stealthy DarkStar. This aircraft, which could possibly be considered a “nephew of DarkStar,” was developed by Lockheed Martin as Unmanned System P-175 and named Polecat. This is a term that describes a member of the weasel family but is also synonymous with “skunk” in American slang, therefore suggesting a reference to the Skunk Works. Polecat could also be a reference to the pole that is used to hold a model of an aircraft aloft when evaluating the RCS of its airframe shape. Whatever the origin of the moniker, the P-175 was first flown in 2005 and disclosed to the media in July 2006 at the Farnborough International Air Show in England. The aircraft itself made no appearance, remaining safely beyond public gaze within the confines of Area 51. Indeed, the company had spent $27 million of its own money on the program, which Mauro described as a “significant” proportion of the company’s research aircraft budget during the period. However, it is also significant that the Polecat was developed in a year and a half, a very short time to bring an aircraft that involves innovative technology from initial concept to first flight. Only one Polecat was built, constructed of 98 percent composite materials, and with a wingspan of 90 feet. The company acknowledged having pioneered a low-temperature curing process for composites used in the aircraft. In this case, the composites were cured at 150 degrees Fahrenheit rather that the 350 degrees of a conventional autoclave. The idea was cost savings. The Polecat had a gross weight of 9,000 pounds and was designed with a payload bay between the wings that could accommodate a half ton of sensors, reconnaissance gear, or weapons. It was powered by two FJ44-3E Williams International engines. An innovative “twisting strut” inside the Polecat’s wings had, according to Lockheed Martin, been designed to “flex in air and improve the laminar flow over its swept wings, propelling the UAV to high altitudes.” The intended operational altitude of the Polecat was specified at 60,000 feet, much greater than that of the UCAV/UCAS demonstrators. An important design feature that the DarkStar and Polecat shared with the X-45 and the X-47, as well as with the B-2, is the absence of vertical tail surfaces. This design feature, which helps to reduce the RCS, is still considered to be very leading edge technology in the twenty-first century. However, recall that this innovation had been pioneered a half century earlier in Germany by Walter and Reimer Horten. Lockheed Martin intended to continue flying the Polecat in an ambitious series of high-altitude test flights, but on December 18, 2006, over the Nellis Range, the sole Polecat prototype suffered what Lockheed Martin characterized as an “irreversible unintentional failure in the flight termination ground equipment, which caused the aircraft’s automatic fail-safe flight termination mode to activate.” The aircraft was destroyed in the ensuing crash. In March 2007, Flight International reported that the notion of “building a replacement” for the Polecat was under consideration. When a Lockheed Martin statement affirmed that a Polecaat replacement was “certainly being discussed,” few outside the Skunk Works and the shadowy corners of the world of Tonopah and Groom Lake realized that something else was already in development. Nor was there any indication that such a thing might be afoot until a tailless flying wing very similar to the Polecat was observed in the skies over Afghanistan later in 2007. This aircraft was Lockheed Martin’s Sentinel, a UAV that bore the designation RQ-170. Assigned for no reason that was then apparent, this designation was far out of sequence with the US Air Force reconnaissance drone nomenclature that then topped out at just eighteen with the Boeing YMQ-18A Hummingbird, a rotorcraft UAV. The higher number suggests that the RQ-170 designation was that used by the CIA, where manufacturer model numbers, rather than military designations, are used. The Lockheed A-12 and the Ryan Model 147 are examples of such aircraft. The Polecat did bear the nearby company designator, P-175. It is possible that Sentinels were operated by both the US Air Force and the CIA, as are Predator drones. The Air Force Sentinels were based inside the deep black world of the Nellis Range and the Tonopah Test Range, where they were assigned to the 30th Reconnaissance Squadron. This unit dated back to World War II and was operational until inactivated in 1976. Reactivated in 2005, the 30th was assigned first to the 57th Operations Group at Nellis AFB and then to the 432nd Air Expeditionary Wing at Creech AFB, the umbrella organization for UAVs, such as the Predator and Reaper, that were active over southwest Asia. It was no secret that American UAVs had been operating routinely over Pakistan for years, and Sentinels were probably also active. Numerous RQ-170 missions were reportedly flown in preparation for Operation Neptune Spear, the successful effort to take out Osama bin Laden, who was killed at his compound in Abbotabad, Pakistan, on May 2, 2011, by US Navy SEALs. Both Sweetman and Fulghum were on the mark in suggesting that the Beast’s primary mission was to snoop on places such as Iran. This intent became painfully clear on December 4, 2011, when one of the stealthy aircraft fell into the hands of the Iranian government near the city of Kashmar in northeastern Iran, 140 miles from the Afghan border. Western news media reported that it had been “shot down,” although when the Iranians put the RQ-170 on display it was clear that it had not been hit by a surface-to-air missile. The Iranians claimed that their cyber warfare experts took over the control telemetry channel and landed the aircraft. The US DOD said it was “flying a mission over western Afghanistan” when control was lost, adding that the aircraft had crash-landed. With this, the United States predictably asked that the RQ-170 be returned, and the Iranians, just as predictably, refused. Also as could have been expected, the Iranians insisted that they were going to build a copy of the aircraft. As of February 2013, when Iran first released FMV footage downloaded from the RQ-170, the reverse-engineered replica had not yet appeared. Back in the United States, a window into the future of twenty-first century black airplanes continued to be found in a look at industry-funded projects such as the Bird of Prey and the Polecat. Boeing and Lockheed Martin had not funded these programs internally on a whim, but under the assumption that the technology being developed would evolve into a salable future product—such as the RQ-170 and who knows what else. The Phantom Ray entered its flight test program with a seventeen-minute first flight from Edwards AFB on April 27, 2011. While this first flight was announced, and it took place at an officially acknowledged facility rather than at Groom Lake, little more has been said officially, so it is hard to know the nature of the black world iceberg of which the Phantom Ray is the tip. “The fact of the matter is that we have a stealthy, remotely piloted aircraft that’s out there,” General David Deptula, the Air Force Deputy Chief of Staff for Intelligence, Surveillance and Reconnaissance, told reporters back in 2010 when he was asked about the secrecy surrounding the RQ-170. There are other ongoing, but little heralded, programs that provide tantalizing clues into what might be going on at Area 51 and the other areas about which we know even less. There is DARPA’s Vulture program, aimed at developing a solar-powered UAV that can stay aloft for five years. The Boeing X-37B Orbital Test Vehicle is a UAV spaceplane that has already been operational in space on missions lasting more than a year. Speed, as well as duration, has always been the hallmark of the black programs at Area 51. An indication of what might be going on in the black world is indicated by the Boeing X-51 Waverider. Powered by a Pratt & Whitney Rocketdyne SJY61 scramjet engine, it rides its own shockwave to hypersonic flight. By 2012, the Waverider had demonstrated speeds up to Mach 4.88. The only certain thing about the skies over Area 51 are shapes and treatments that will keep black airplane speculators and aviation enthusiasts busy well into the twenty-first century.